This article is about the fictional ship in the Pirates of the Caribbean series. For other uses, see Black Pearl (disambiguation). 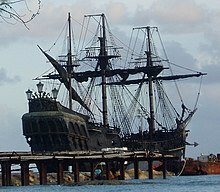 The Black Pearl is a fictional ship in the Pirates of the Caribbean film series. (The physical ship used as a prop during filmmaking is actually named the Sunset.) In the screenplay, the Black Pearl is easily recognized by her distinctive black hull and sails. Captained by Jack Sparrow, she is said to be "nigh uncatchable". Indeed, in the first three films she either overtakes or flees all other ships, including the Interceptor (regarded as the fastest ship in the Caribbean) and the Flying Dutchman (which is actually faster against the wind). Her speed is partly derived from the large amount of sails she carries, and partly supernatural. She is noted in At World's End as being "the only ship that can outrun the Dutchman." The Black Pearl was originally a merchant ship called Wicked Wench (the name of the ship from the Pirates of the Caribbean attraction at Disneyland Park, which is shown shelling a fort), but its crew later turned to piracy under the command of a pirate captain named Morgan, who was killed during a battle with Spanish Royal Navy Captain Armando Salazar. The helmsman, Jack Sparrow, was granted captaincy of the Wicked Wench after out-maneuvering Salazar and saving the crew during battle. Years later, the Wicked Wench became registered to the East India Trading Co. and owned by Cutler Beckett, the EITC Director for West Africa. At the time, Jack Sparrow was in the employ of the East India Trading Co. and regained captaincy of the Wicked Wench (this fits in with reality as history notes that pirates did not build ships specifically to commit piracy. Instead, they either bought or stole small, fast vessels, then retrofitted them with heavy armaments). Jack Sparrow captained the Wicked Wench for Cutler Beckett for about a year, hauling various cargoes, but he refused to haul slaves. Hoping to recruit Sparrow as one of his many "operatives", Beckett indulged what he regarded as an odd peccadillo of Sparrow's until he and the captain came to part ways. Beckett had dispatched Sparrow on a mission to find the lost island of Kerma, and the treasure at the heart of its underground labyrinth, but Sparrow double-crossed the EITC official and claimed he couldn't locate the island. Suspicious that Sparrow had indeed found the island and the treasure, but had not given him its accurate location, Beckett, determined to browbeat the captain into obedience, demanded that the young captain transport a cargo of slaves to the New World. Initially Sparrow agreed, but when he realized that he was betraying the Wicked Wench, as well as himself, he rebelled and freed the slaves by taking them to Kerma for safe asylum. Furious that Sparrow had flouted his orders and stolen the "cargo" of "black gold", Beckett had Sparrow thrown into jail. After allowing him to languish for a couple of months, Beckett had Sparrow transported to the Wicked Wench's anchorage, about a mile from the coast of West Africa, near Calabar on the Bight of Benin. After personally branding Sparrow with the "P" brand (so he'd be forever identifiable as a pirate), Cutler Beckett gave the order to fire incendiary carcass charges at the Wicked Wench, in order to totally demoralize her captain. Sparrow fought his way free from his guards, dove overboard and attempted to rescue his burning, foundering ship, but he was too late. The Wicked Wench turned into an inferno, then sank, taking Jack with her. 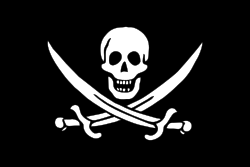 But, while dying, Sparrow called upon Davy Jones, and struck a bargain with him: his soul and one hundred years service aboard the Flying Dutchman, in return for a continued human existence of thirteen years as captain, plus saving the Wicked Wench and transforming her into the fastest, most dangerous pirate ship on the seven seas. Jones agreed, and raised the ship from the sea floor, now a charred vessel with an angel figurehead. In keeping with her scorched appearance, Jack painted his ship black and added black sails, rechristening her "the Black Pearl". Two years later, the Black Pearl was in search of the mysterious Isla de Muerta with a new crew, where the legendary Chest of Cortés was hidden. Captain and crew agreed to equal shares of the treasure, but devious first mate Hector Barbossa persuaded Jack that equal shares included knowing the treasure's location. Jack complied, and soon after Barbossa led a mutiny and marooned Jack on an island. The crew found the Aztec gold, which was spent very quickly, not believing in the curse placed on it: that anyone who stole the coins would become an undead being, unable to feel anything but unsoothable hunger, and that only moonlight would reveal their true form. This curse being real, the pirates were soon hideous living skeletons with tattered flesh and clothing clinging to their bones. Even the Black Pearl was affected by the curse upon its crew, becoming constantly shrouded in an eerie mist and operating with tattered sails ripped in many places. The curse could only be lifted when all eight hundred and eighty two coins were returned to the chest along with a trace of blood from each pirate who stole one. William "Bootstrap Bill" Turner Sr., the only crew member who defended Jack Sparrow during the mutiny, sent a coin to his young son Will Turner in England, believing the crew "deserved to be cursed, and remain cursed". In retaliation, Barbossa (as Pintel put it), "strapped a cannon to old Bootstrap's bootstraps. The last we saw of old Bill Turner... he was sinking to the crushing black oblivion of Davy Jones' locker". Only then did Barbossa's crew learn that they also needed Bootstrap's blood to break the curse, and by throwing him overboard they had, in fact, doomed themselves to continued damnation. Over the next decade, the Black Pearl menaced the Caribbean as the pirates searched tirelessly for the Aztec gold, until all but one piece was found. As a boy, Will Turner Jr. brought the gold medallion with him on his journey to the Caribbean, although Elizabeth Swann, the governor's daughter, came into possession of it and kept it hidden for eight years. The Pearl later attacked Port Royal and abducted Elizabeth, believing she was Bootstrap's child—their only remaining source of Turner blood when it was really Will. The Pearl is eventually commandeered by Sparrow with a new crew. While most of Barbossa's crew are battling the Royal Navy aboard HMS Dauntless, Barbossa, Monk, Jacoby and Weatherby fight Elizabeth, Will and a now-cursed Jack Sparrow at Isla de Muerta. After Will and Jack put their blood on their respective pieces and return them to the chest of Cortés, the Aztec curse is lifted. With the crew no longer immortal, Jack uses his single shot - which he carried for ten years - to kill Barbossa. During the battle, Jack's crew are able to commandeer the Pearl, leaving Jack behind at Isla de Muerta. However, they later rescue him after he escapes execution in Port Royal, and he again takes command of the ship. The Black Pearl was pursued by Commodore James Norrington and the Royal Navy. Off of Tripoli, a large hurricane battered the Pearl (though it survived) and HMS Dauntless, which sank, along with most of its crew. Norrington survived, and later resigned from the Navy. One year later, the Black Pearl is still being captained by Jack Sparrow, although his crew is not content with him; they want "a speck of honest pirating", and are upset about the Royal Navy's pursuit and the hurricane. Davy Jones sends Bootstrap Bill Turner to remind Jack that he owes his soul and one hundred years of service aboard the Flying Dutchman to Jones; Jack's thirteen years of captaincy have now passed. Jack is marked with the black spot, which means that the Kraken is now hunting to drag both Sparrow and his ship down to the Locker. Jack has the ship sailed to the nearest land - Pelegosto, an island inhabited by a cannibal tribe. Jack and the surviving crew escape the cannibals with Will Turner, Pintel and Ragetti, and visit the voodoo priestess Tia Dalma for advice. Dalma details how Davy Jones cut out his own heart and locked it in the hidden "Dead Man's Chest"). The crew learns that if Jones' heart is stabbed, he will die, so whomever controls Jones' heart can command Jones himself. Dalma then helps the crew of the Pearl track down the Flying Dutchman. When Jack sends Will over to the Dutchman, the Pearl is boarded by Jones' cursed crew. Jack makes a deal with Davy Jones; he will deliver Jones 100 souls in three days in exchange for his own. Jones agrees, temporarily removing the Black Spot from Jack's palm. Jones and his crew then depart aboard the Dutchman with Will (who is "a good-faith payment"), while the Pearl travels to Tortuga to "recruit" the remaining 99 souls. In Tortuga, Jack runs into Elizabeth and a drunk, washed-up James Norrington. Owing to her desire to find Will, Elizabeth is able to provide Jack with a heading to the dead man's chest, which is buried on Isla Cruces. With each desiring control of Jones for his own ends, a three-way sword fight ensues between Jack, Norrington and Will (who has escaped from the Dutchman with the help of his father). After Jack manages to obtain the heart of Davy Jones from the chest (which is secretly stolen from him by Norrington), the Black Pearl is attacked by the Flying Dutchman. However, the Pearl is able to outrun the Dutchman owing to a favourable wind (the Pearl being faster with the wind). Davy Jones then unleashes the Kraken on the Pearl. Despite successfully fighting the Kraken off twice, the ship still sustains heavy damage and most of her crew are killed. Jack orders the surviving crew of Will After figuring out that the Kraken is only after Jack and not the Pearl, Elizabeth distracts Jack by kissing him, then chains him to the ship's mast and leaves him behind. Resigned to his fate, Jack bravely charges the maw of the Kraken, and the Pearl is dragged down to Davy Jones' Locker as the surviving crew watches. Mourning the loss of Sparrow, the crew return to Tia Dalma's shack. There, Dalma asks them if they would "sail to the ends of the Earth and beyond, to fetch back 'witty Jack' and his precious Pearl". Gibbs, Pintel, Ragetti, Cotton's parrot (who speaks for both itself and its master), Elizabeth and Will all agree. Tia Dalma then announces their new captain, Hector Barbossa, who asks what has become of "his" ship. Led by the newly-resurrected Captain Barbossa, Tia Dalma and the crew of the Black Pearl vow to rescue Jack Sparrow and his ship from Davy Jones' Locker. By means of Chinese navigational charts from the Pirate Lord of Singapore, Sao Feng, they find themselves in the Locker. Jack and the Pearl are stranded in a seemingly-endless desert, but Tia Dalma is able to use the Locker's mysterious crustaceans (crabs that appear to be rocks) to transport Jack and the Pearl to the nearby shore. Jack deciphers a clue from the navigational charts, and the crew capsize the ship at sunset. The Black Pearl then returns to the living world at sunrise. Back in the realm of the living, the Black Pearl resupplies at an island, but is ambushed by Sao Feng (aboard his vessel Empress) and Jack's old enemy Cutler Beckett (aboard his flagship HMS Endeavour). Disputes mean that the Pearl is now desired by multiple characters. Captain Sparrow's claim is that it is his ship; Captain Barbossa's is that it was his ship; Will needs the Pearl to free his father from Davy Jones; Sao Feng covets the fastest ship in the Caribbean, and Cutler Beckett won't "give up the only ship that can outrun the Dutchman". After Elizabeth joins Sao Feng on the Empress, the Pearl and the Empress launch a surprise attack on the Endeavour and flee. In response, Beckett sends the Flying Dutchman to track down the Empress. Sao Feng is mortally wounded in the ensuing attack, and dies after naming Elizabeth his successor as captain. Meanwhile, the Black Pearl escapes to "Shipwreck Cove", a secret pirate rendezvous, where the fourth meeting of the Brethren Court is then convened. After Captain Elizabeth Swann arrives, the Pearl becomes the flagship of the Pirate Armada, led by the elected Pirate King, Elizabeth Swann. Captain Sparrow, Captain Barbossa and Captain Swann take a parley with Lord Beckett, Davy Jones and Will Turner (who was pushed overboard by Sparrow for his attempted mutiny on the crew of the Pearl). After Beckett reveals that Jack purposefully used Will's betrayal to try to save himself from Jones' wrath, Captains Swann and Barbossa trade Jack for Will; Jack is then imprisoned in the brig of the Dutchman. Helmed by Captain Barbossa, the Black Pearl then engages in a sea battle around a maelstrom against the Flying Dutchman. The two ships are evenly matched, and both are damaged by the other's cannons and later boarded. On the Dutchman, Jack escapes the brig and engages Davy Jones in a sword fight. Stealing the key to the dead man's chest from Jones, Jack threatens his foe with stabbing Jones' heart. However, Jones fatally stabs a downed Will Turner, and Jack instead helps Will to stab Jones' heart, killing Jones. As both ships near the bottom of the maelstrom, the topmasts become entangled. The Dutchman begins to pull down both ships, so Pintel and Ragetti fire a chain-shot at the entangled masts. Jack and Elizabeth escape the Dutchman using a makeshift parasail, and the Pearl escapes the maelstrom while the Dutchman sinks. Once the storm subsides, the Pearl is still afloat but substantially damaged, and no match for the Endeavour which is advancing on it. However, the Dutchman resurfaces with Captain Will Turner in command. The Black Pearl and the Flying Dutchman sail alongside each other and destroy the Endeavor, killing Lord Cutler Beckett and forcing the now-leaderless EITC Armada to flee. In Tortuga, Jack again loses the Black Pearl to Barbossa, though the crew of the Pearl (including Pintel, Ragetti, Marty, Murtogg and Mullroy), "are unsettled about leaving Captain Jack behind - again", indeed they all leave the Black Pearl and Barbossa recruits a new crew. However, Sparrow has secretly stolen the critical portion of Barbossa's navigational charts, and go back to searching for the Pearl and for the immortality. Some time after leaving Tortuga, the Black Pearl was attacked by the pirate ship Queen Anne's Revenge, captained by the infamous Blackbeard. Using the supernatural powers of the Sword of Triton, Blackbeard brought the rigging of the Pearl to life, which wrapped around Barbossa's crew "like snakes". Barbossa's men were swiftly defeated and the Black Pearl captured, magically shrunk and placed in a bottle by Blackbeard. Barbossa thought himself the only survivor of the attack, being forced to cut off his own leg to escape the doomed Pearl. After Blackbeard's death, Jack regains the Pearl in a bottle, and Gibbs fills a large sack with the bottles of other fallen ships from Queen Anne's Revenge; as the film concludes, Jack states that he is aware of a way of getting the Pearl back to full size, but it will require "a crossbow, an hourglass, three goats, one of [them] must learn to play the trumpet, whilst the other one goes like this" ("this" being a wiggling of the fingers). Barbossa also claims Blackbeard's ship, sword and surviving crew after Blackbeard's demise. The Black Pearl appears in the fifth installment of the movie franchise in its original form (as the Wicked Wench). The Wicked Wench makes its appearance during a sequence where Captain Armando Salazar is reminiscing about how and when he first met Jack Sparrow. In the flashback, the Wicked Wench's helmsman is a young Jack Sparrow. While being chased by Salazar's ship the Silent Mary into unknown water, the crew of the Wicked Wench throw ropes around nearby reefs off the port side and use the rigging to slingshot the ship into the opposite direction. Jack steers the ship through the reef, saving the crew and the ship by changing the ship's course at the last second. Afterward, on the deck of the Wicked Wench, the crew rewards Sparrow with "tribute" and bestow Jack with his famous hat and other personal effects. They make Jack a captain on the deck of the ship. We also learn Jack also got the name "Sparrow" by taunting Salazar, "chirping like a sparrow" from the crow's nest of the Wench. In the present day, the Pearl has remained trapped in its bottle for 'five winters', Jack keeping it in his pocket even as he is forced to use a smaller ship known as the Dying Gull to go to sea. Later in the film, Barbossa uses Blackbeard's sword to restore the Pearl to its regular size; stabbing the bottle with Blackbeard's sword cracks it, the bottle subsequently breaking as the Pearl grows to the size of a larger model, only regaining its full size when it returns to the sea. Barbossa then claims the ship for himself to battle the undead Captain Salazar, tying Jack to the rear of the ship, however later Jack manage to escape thanks to the help of Henry Turner, son of Will Turner and Elizabeth Swann which has formed an alleance with him to find the Trident. After tracking down the island where the Trident of Poseidon is located, triggering a mystical convergence that opens a trench in the ocean, Salazar claims the Trident for himself, but Henry and Carina Smyth destroy the trident when Salazar attempts to use it to kill Jack. The destruction of the trident restores Salazar and his men to full life, but also causes the sea trench to collapse, with the Pearl's crew lowering its anchor to pull Jack, Henry and Carina to safety. Salazar attempts to climb up the anchor to attack Jack, but Barbossa sacrifices himself to stab Salazar and save the others (Carina having been identified as his daughter). At the film's conclusion, after witnessing Carina and Henry as they watch Will Turner's reunion with Elizabeth Swan- the destruction of the Trident also freeing Will from his role as captain of the Flying Dutchman, Jack departs as he is restored to his traditional role as the captain of the Black Pearl with both his crew from the Dying Gull and Barbossa's crew from the Queen Anne's Revenge joining him. The Black Pearl is moderately armed and carries 32 twelve-pound cannons: 18 on the gun deck and 14 on the upper deck. Its full broadside contains 16 cannonballs that weigh 192 lb (192 pounds (87 kg)). Extremely unusual for a pirate ship, the Pearl has no chase guns (cannons used while being chased or chasing, as a regular broadside volley cannot be used in this situation) in her bow or stern, giving her a grave tactical disadvantage during a chase as the Pearl cannot shoot a ship it is chasing or return fire at a pursuer; her high speed only partially negates this handicap. In Dead Man's Chest another advantage the Black Pearl has over her enemies is her ability to hide in the sea at night, since if all the ship's lamps are blown out the ship is no longer visible thanks to her black hull and sails. This is also seen in Curse of the Black Pearl where she is able to sneak unhindered into Port Royal under the cover of darkness. In the first movie, the Black Pearl was a steel barge with wooden structures built on top to resemble a real ship. In addition, a soundstage set was used to achieve better control over fog machines. For the second and third movies, a floating sailing ship was actually built in the shipyards at Bayou La Batre in Alabama on the hull of the cargo ship Sunset to serve as the set, though it is not an authentic tall ship. Another version, mounted on a gimbal, was built for filming the Maelstrom battle. In 2010, the Sunset, which played the Black Pearl in most of the films, was reconstructed to portray the Queen Anne's Revenge in Pirates of the Caribbean: On Stranger Tides. ^ "Black Pearl sets sail again: Pirates Of The Caribbean ship heads for the high seas on the back of a container vessel". Daily Mail. 12 November 2012. Retrieved 26 June 2017.